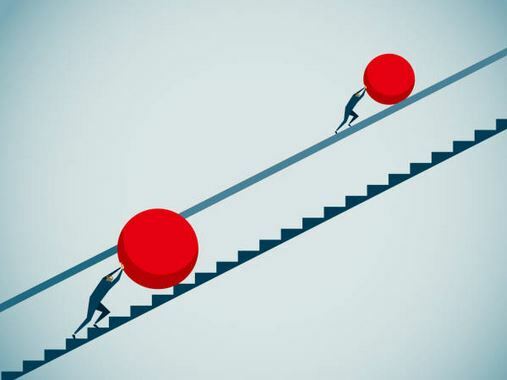 Career resilience is becoming increasingly important in a rapidly changing work environment – but not everyone is naturally resilient. This blog post will explain how you can build resilience strategies to help you develop a positive mind set for future career growth. What is meant by career resilience? How can you develop your own career resilience? You can think of resilience like an elastic band. It’s the ability to bounce back after life stretches you and flourish. Resilience is the capacity to adapt, cope and overcome barriers and adapt to problems as and when they arise by finding appropriate solutions. In the workplace, it’s about not giving up at the first hurdle when you are managing unrealistic expections in your role and finding coping mechanisms for different scenarios. Developing career resilience is important so that we can build confidence in taking on and succeeding in challenging tasks. It involves perseverance and being flexible in how you achieve goals. Resilient people are confident that they’re going to succeed eventually, despite setbacks or failures. 3. Limiting and reducing risk factors with things that might cause us stress in the future. Psychological capital is having the capacity to move into and adapt to a fluid job market, and being able to withstand the challenges and pressures that throws at us. People with developed psychological capital have the capacity to adapt and demonstrate resilience, which is where our resilience fits, but there are other types of capital that we need to develop. Resilience is never developed in isolation. For example, we need human capital, which is developing knowledge and skills, so we become well-rounded professionals. We need to develop our social capital, so we develop networks and social relations to enhance our knowledge, and to access and target employment. We need to develop cultural capital, which is appreciating the culture of sectors and organisations and really being able to present yourself and your profile in a credible way. We also need to develop our own identity capital, which is understanding our experiences, our values and achievements, which supports our development of our professional profile, and our professional self. It’s also about the development of strategies to accomplish our career goals. You might well be thinking that you don’t feel very resilient, particularly if you’ve experienced recent setbacks. If so, don’t worry. Not many of us are lucky enough to be naturally resilient. Resilient people understand that things change and that carefully made plans might sometimes need to be amended or scrapped. So, being prepared to look at alternative routes to reach your goals, or possibly even changing your goals completely when necessary, is really important. For example, you might need to change the timescale that you had in mind for changing your career. You might need to think about an alternative route to reach your goal. You might need to think about a different career altogether, that’s going to be more realistic for you. So, it’s not being too fixed in your thinking. There’s been a lot of research to show that getting enough sleep and exercise is important for managing stress, and for coping effectively with challenges that come up in your life. Good physical health can play a part in helping you build a sense of confidence and control, which is really crucial for building resilience. As well as being physically fit, it’s also important to be mentally fit. Keep reading and learning. Research shows having a strong support network will help reduce stress. Harnessing personal support might sound like common sense, but having an adviser of some sort, a friend, family member, even an online community to cheer you on through those difficult times, can really help you build resilience. Create a short term action plan to help you towards longer term goals. If you have a career goal in mind, consider if you need to undertake any training. Think about who in your network, you could speak to who is in a similar role and can share with you, their experiences.